Symmetra 230 V - 4-16 kVA N + 1 Redundant rack/tower convertible 13U-19U & 4-16 kVA N + 1 Redundant extended run tower UPS. Highly available single phase UPS features redundant and scalable double-conversion on-line power protection. Symmetra™ 230 V uses a modular, redundant architecture that can scale power and runtime as demand increases or when higher levels of availability are required. APC Symmetra RM 4kVA Scalable to 6kVA N+1 220-240V. Highly available single phase UPS features redundant and scalable double-conversion on-line power protection. APC Symmetra RM 6kVA Scalable to 6kVA N+1 220-240V. 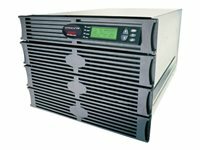 Highly available single phase UPS features redundant and scalable double-conversion on-line power protection.